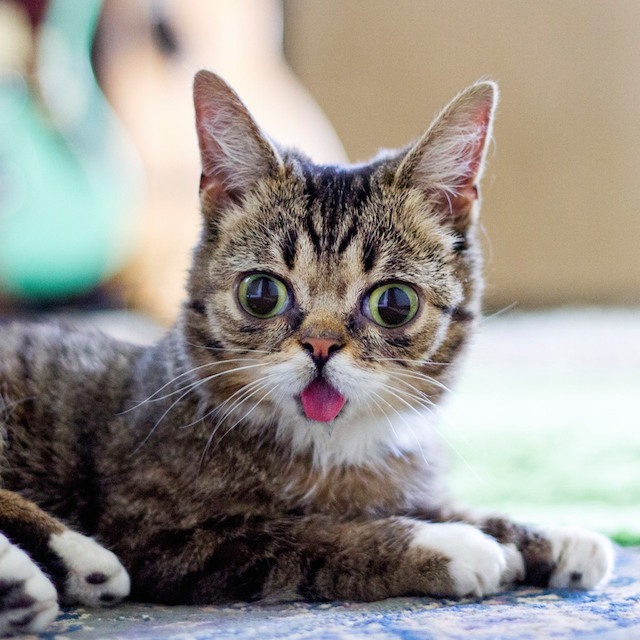 Want to meet Lil BUB? Come celebrate the launch of our new book, A Letter To My Cat, and party with Lil Bub! Write your own letter to BUB to tell her why she’s special and submit it by Tuesday, Nov. 11 and you could win an invite to the A Letter to My Cat book launch party on Thursday, Nov. 13 — where you’ll meet Lil BUB! The party is in Los Angeles, so this contest is for LA-area BUB fans only (… or anyone willing to travel to LA on short notice!). To enter, email us your letter (100 words or less!!) to meow@alettertomycat.com. Can’t wait to share some of your love notes with BUB! THIS GIVEAWAY IS OPEN TO US RESIDENTS ONLY. SORRY INTERNATIONAL FANS! THIS IS NOT A SPONSORED GIVEAWAY. NO PURCHASE NECESSARY TO PARTICIPATE IN THIS GIVEAWAY. I was down on my luck finding a job I loved, then I got some lil bub socks, you in a spaceship…and i wore them to a job interview I really wanted & guess what, I GOT IT! So, good job bub, thanks for the luck. I hope to meet you at the book party and yes I live in LA. Thank you meowy much for sharing letters and your lives with me. I’ve had cats all my life except now and I really miss all the snuggling and the purrs. Pictures of other cats on the internet make me feel a little better, but there’s no substitute for the “real” thing. I hope that you will always have a roof over your head, lots of food and treats, and a human who really loves you. I hope Bub gets my letter! For a while I was worried about you. You seemed vlunerable and special. In the hands of a man I thought was maybe, maybe exploiting you for his own gains. I saw a video on YouTube that seemed that you were in the company of humans that were under the influence. That made me worried about your welfare. That was quite a while ago, and since then everything seems to have become more altruistic. It seems your dude has become more professional and polished. You look at your best. I wish the same for all kittays. I enjoy your efforts to help others. I cannot afford your products, but applaud the efforts made to help other cats in need. I know I won’t win because I have expressed concern about the people your dude was keeping company with. But as a Star Trek fan abd having 4 special kits of my own, I wish that you “Live Long and Prosper”. hello LIL BUB ! avec tes yeux merveilleux,tu me fais rêver. tu es le plus beau de tous les chats étranges ! je vois que tes maîtres sont fous de toi et c est bien normal !Quel talent tu as !tu poses en vrai pro pour les photos qui sont d ailleurs superbes. J aimerai tellement pouvoir te rencontrer et te faire des bisous d amour partout !Je pense à toi tous les jours et prends de tes nouvelles régulièrement.Tu fais parti de ma famille depuis le début.Jhabite en FRANCE,donc loin de toi,mais la distance n empêche pas tout l amour que j ai pour toi. TU ES DANS MA VIE POUR TOUJOURS LIL BUB. I LOVE YOU ! Lil BUB is an earth angel that spreads smiles across the miles.